Recently I've been looking into redecorating my home, not a full on transformation of every room but a few tweaks here and there just to give everything a bit of an update and a refresh. I've always been a fan of Ikea, and I dream of having my entire house filled with pretty accessories and white shabby chic style furniture. 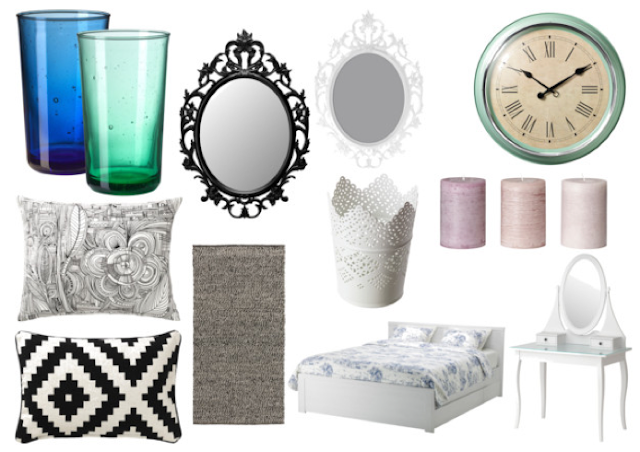 For my living room, I'm wanting to have a grey and cream room, with little bits of black and lilac. The big mirror and white photo frame would look lovely on the walls, then the neutral rug on the floor would be a great contrast to the bold (yet still fitting with the theme) cushions, which would add a bit of a modern spin on the whole look... I especially love the aztec print one. I think that, mixed in with some plain coloured cushions would look great. The candles are the perfect colours for what I have in mind for the room too... and you can never have too many candles! For the kitchen, I'm not 100% decided on what theme I want to go with. At the minute the room is very basic, with a white and grey colour scheme. As I don't want to spend too much money on each room, I'll be able to get away with simply adding a few brighter accessories, such as the clock and the gorgeous coloured glasses. In an ideal world, my house would be fully kitted out like in the new Ikea advert... have you seen it?! They've even made an extended video (which I have embedded below) where you get to see a full tour of the house - it's such a good idea and concept. I love how the dolls look like real life people, but most of all I just love the house! I need the living room shelving and storage, the transformation station (aka the best wardrobe ever!) and the cool bed with the table on top - perfect excuse for breakfast in bed each day! If you like the video as much as I do, you can follow Mandy, the living doll on Twitter! Do you have any Ikea furniture? What would you recommend I get? you picked out some gorgeous stuff!